Narrow slit and small deformation of the workpiece. 3. Nozzle design and air flow control technology. Operation Cost Analysis of Laser Cutter. 3) Operation cost analysis table. Laser cutting is a hot cutting method which makes use of the focused laser beam as the main heat source. The technology uses the energy of a laser beam to illuminate the surface of the steel plate to melt and vaporize the stainless steel. We already know what is laser cutting, but what is a laser cutter? And how are works for laser cutting machine? Let’s dive into it. 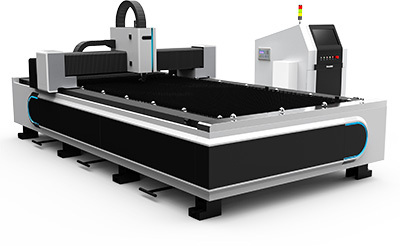 Laser cutting machine: a laser beam that will be fired from the laser generator, which is focused into a laser beam with high power density through the optical path system. The laser beam hits the surface of the workpiece so that the workpiece reaches the melting point or boiling point, while the high-pressure gas that is aligned with the beam will blow away the melt or vaporized metal. With the movement of the beam and the relative position of the workpiece, the material is finally cut and slit so as to achieve the purpose of cutting. Laser cutting is used to replace the traditional mechanical knife with invisible beams. It featured high precision, fast cutting, not limited to cutting pattern limitation, automatic typesetting saving material, smooth incision, low processing cost. The laser cutting method will gradually improve or replace the traditional metal cutting process equipment. The mechanical part of the laser cutter has no contact with the workpiece, and it will not scratch the surface of the workpiece at work. The laser cutting speed is fast and the incision is smooth and no need for subsequent processing. The cutting heat affected area is small, the plate deformation is small, and the slit is narrow (0.1mm~0.3mm). No mechanical stress, no shear burr. High machining accuracy, good repeatability, no damage to the material surface. Can cut a large piece of the whole plate without opening the mold and saving time. The world’s first laser cutting machine was born in the 1970s. Over the past 30 years, with the continuous expansion of the application and continuous improvement of the laser cutting machine, many enterprises have been engaged in the production of various laser cutting machines to meet the demand of the market, including 2D plate laser cutting machine, 3D space laser curve cutting machine, pipe laser cutting machine. Trumpf (Germany), Prima(Italy), Bystronic (Switzerland), Amada (Japan), MAZAK (Japan), NTC (Japan), HGLaserLab (Australia). Laser cutting equipment can cut stainless steel below 4mm, and can cut up to 8 ~ 10mm thick stainless steel in laser beam if add oxygen. However, when oxygenated, a thin oxide film is formed on the cutting surface. The maximum thickness of cutting can be increased to 16mm, but the size error of the cutting part is larger. 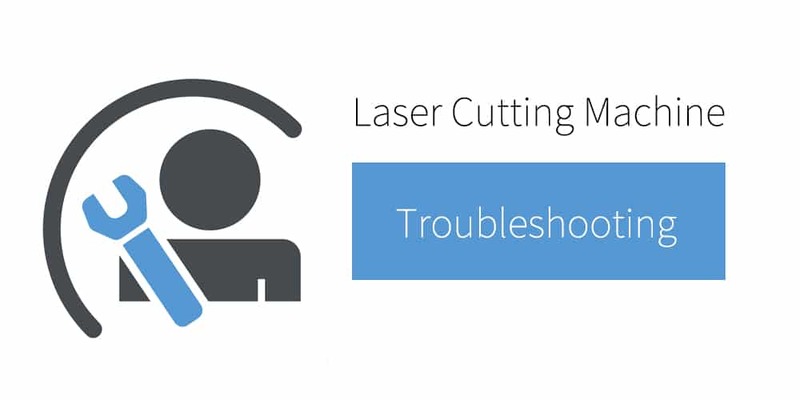 Laser cutting equipment is very expensive, but it is still possible to use the device in large production because of the lower cost of subsequent processing. Since there is no tooling cost, the laser cutting equipment is also suitable for small batches of parts that can not be processed previously. Laser cutting equipment usually adopts device with computerized digital control technology (CNC). After the device is adopted, the cutting data can be received from the computer-aided design (CAD) workstation. Narrow incision width (generally 0.1–0.5mm); High precision (general hole center distance error 0.1–0.4mm, profile size error 0.1–0.5mm); The surface roughness of the incision is good (general Ra is 12.5–25μm), cut seam generally do not need reprocessing to be able to weld. For example, the laser cutter with 2KW laser power been adopted, the cutting speed of carbon steel with 8mm thickness is 1.6m/min. The cutting speed of stainless steel with 2mm thick is 3.5m/min, and the thermal influence area and the deformation are very small. (3) Clean, safe and pollution-free. The working environment of the operator has been greatly improved. Laser cutting uses the laser beam as the heat source for hot cutting, its working principle is similar to laser welding. The temperature of laser cutting exceed 11000 ℃, which would have made any material gasification, therefore gasification also plays an important role in addition to the melting during laser cutting process. The laser cutting process of some materials, such as carbon and some ceramics, purely belongs to the gasification process. The laser cutting of metal mostly adopts high power carbon dioxide continuous laser generator. When cutting, spray the inert gas flow, blow out the incision to melt the metal, and make the incision smooth and straight. The jet’s oxygen flow will increase the cutting speed. The laser cutting has a narrow incision, precise size, smooth surface and better cutting quality than any other hot cutting methods. 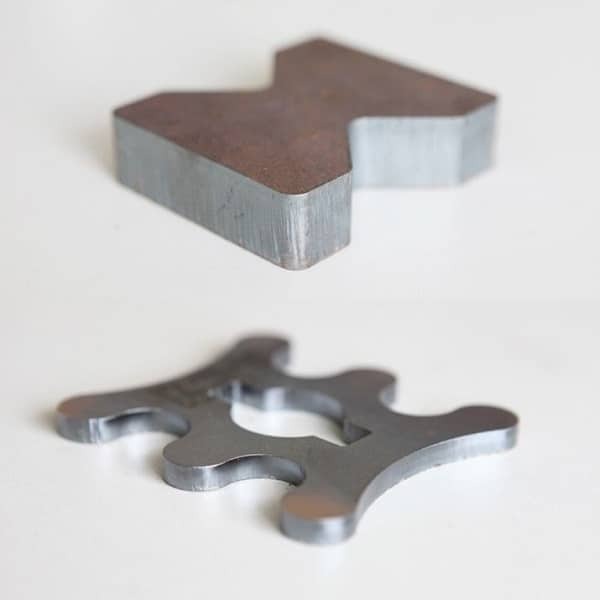 Almost all metal materials can be cut by laser, the cutting thickness various from a few microns to a sheet of 50 mm. The investment of laser cutting equipment is high, it is mainly used for various thickness under 12 mm including stainless steel, titanium and titanium alloy, refractory metal and precious metal precision cutting, can also be used for non-metallic materials cutting such as plastic, wood, cloth, graphite and ceramic. For example, wood processing industry already uses the laser to cut plywood, particle board and garment industry also use the laser for a large number of cutting cloth. In addition, laser cutting is also suitable for some special purposes, such as the stone bearing drilling, the surgeon using the laser as the scalpel. 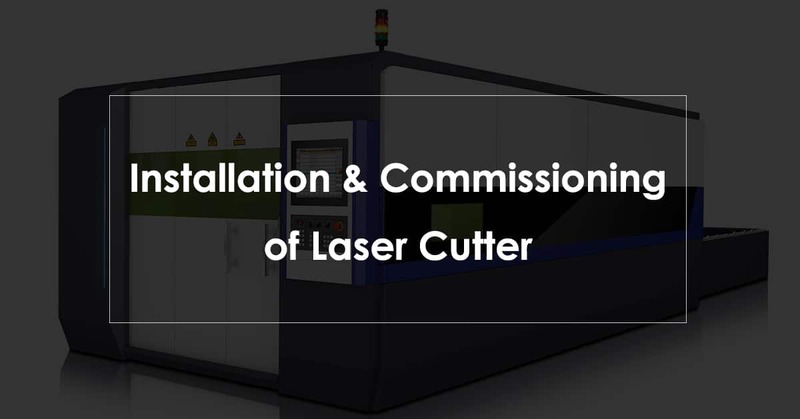 The parameters of the laser beam, the performance and precision of laser cutting machine and NC system will directly affect the efficiency and quality of laser cutting. Using a laser beam with high energy density to heat the workpiece, the temperature rises rapidly, reaching the boiling point of the material in a very short period of time, and the material begins to vaporize and form vapor. These vapors spew out very fast, making an incision in the material at the same time as the vapor. The heat of vaporization of materials is usually very large, so the laser vaporization requires a large amount of power and power density. Laser vaporization is used to cut thin metal materials and non-metallic materials (such as paper, cloth, wood, plastic and rubber, etc.). In the process of vaporization, the steam takes away the melting point and scour debris, forming holes. In the vaporization process, about 40% of the material is dissolved into steam, while 60% of the material is expelled by the flow in the form of a droplet. 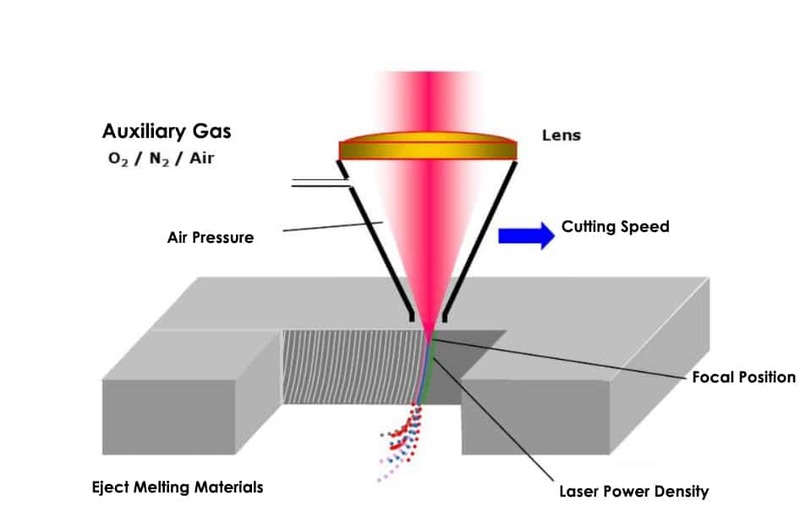 When the power density of the incoming laser beam exceeds a certain value, the material inside the beam irradiation point begins to evaporate and then forming a hole. Once the hole is formed, it absorbs all the incoming beam energy as a black body. The holes are surrounded by molten metal walls, and the auxiliary airflow along the shaft of the beam takes away the molten material around the hole. With the moving of the workpiece, the hole is synchronized horizontally to form a slit in the direction of cutting. The laser beam continues to irradiate along the edge of the seam, and the melting material continues or pulsates been blow away through the cracks. On the one hand, the gas is produced by the cutting of metal, and the oxidation reaction occurs, which gives off a lot of oxidation heat. On the other hand, the molten oxide and the melt are blown out of the reaction area, forming an incision in the metal. Due to oxidation produced a large amount of heat in the process of cutting, so the energy needed of laser oxygen cutting is just 1/2 of molt cutting, and cutting speed is more than laser vaporization cutting and melting cutting. (1) the surface of the material is heated to the point of ignition rapidly under the irradiation of the laser beam, and with the intense combustion reaction with oxygen, a large amount of heat is released. Under this heat, the material is formed by a small hole filled with steam, surrounded by molten metal walls. (2) combustion material is transferred into slag to control the combustion rate of oxygen and metal, and the speed of oxygen diffusion through the slag to the ignition front has a great impact on the combustion speed. The higher the oxygen flow rate, the faster the combustion chemical reaction and the removal of slag. Of course, the oxygen flow rate is not the higher the better, because the fast velocity can lead to the rapid cooling of the metal oxide, which is also detrimental to the cutting quality. (3) obviously, there are two heat sources in the process of oxidation melting, namely, laser irradiation and the heat energy produced by the chemical reaction of oxygen and metals. It is estimated that when the steel is cut, the amount of heat released by the oxidation is about 60% of the total energy required for cutting. It is obvious that using oxygen as an auxiliary gas can achieve high cutting speed compared with the inert gas. (4) in the process of oxidation melting and cutting with two heat sources, if the combustion rate of oxygen is higher than that of the laser beam, the slit appears wide and coarse. If the laser beam moves faster than the oxygen, the cut slit is narrow and smooth. 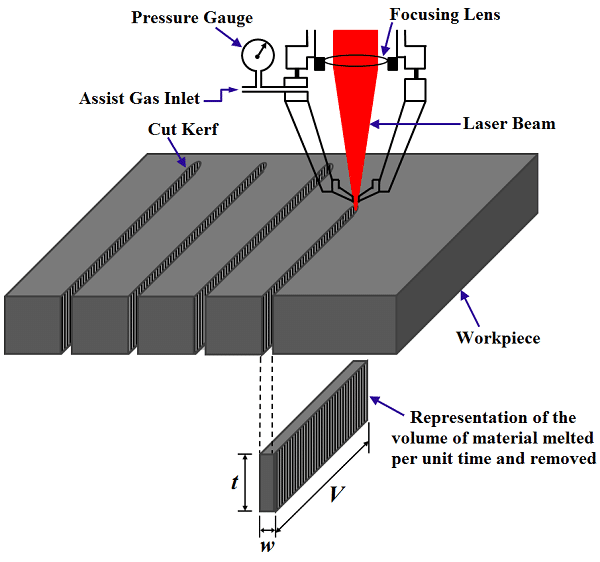 For brittle materials prone to heat damage, high speed and controllable cutting through laser beam heating are called controlled fracturing cutting. The laser beam heats the small area of the brittle material, causing the large thermal gradient and serious mechanical deformation in the region, causing the material to crack. As long as the balanced heating gradient is maintained, the laser beam can guide the cracks in any desired direction. It is important to note that this controlled fracturing cutting is not suitable for cutting acute angle and arm of angle. It is also not easy to achieve success by cutting a very large and closed shape. The cutting speed of the controlled fracturing cutting is fast and does not require too much power, otherwise, it will cause the surface of the workpiece to melt and break the edge of the cutting. Its main control parameters are laser power and spot size. A. solid laser cutter. The solid laser cutter can be divided into the bonus stones laser cutter, YAG laser cutter. Besides, there is also an articulated movable arm fixed optical flight beam transmission form, known as a constant flight path. In the cutting process for the laser cutter which adopts flying ray, only the cutting head moves along the X and Y direction, and the position of the table is fixed. The plate of processing is in big size, with a heavyweight. The equipment covers a small area. No need clamping for fabricating workpiece which is convenient for loading and discharge the materials. The machine has good acceleration and high positioning accuracy. Therefore, it is highly regarded by the market as the mainstream model of the international market. Gantry frame movable flying ray structure. Beam upside down movable flying ray. Cantilever movable flying ray structure. Robot structure & Large format hybrid flying ray. the beams are made of aluminum alloy castings or welds and profiles. Other components use engineering plastics, fiberglass and stainless steel, etc. 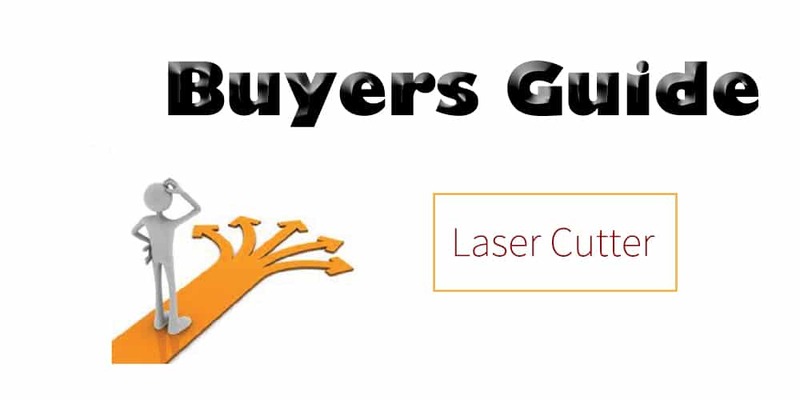 The laser generator required by the laser cutter shall be selected according to the user’s processing performance, processing materials, shapes and sizes, etc. The available laser generators include co2 axis fast-flow laser generator, RF board debugging laser generator, swirl laser generator, the solid-state laser generator and a fiber laser generator. X and Y axis are selected with a single – side servo motor and equipped with the corresponding speed reducer, which is driven by the high precision gear rack. The X axis is selected with the servo motor and equipped with the corresponding reducer, which is driven by the high precision gear rack. There are two gears to eliminate reverse clearance. Directly driven by high precision ball screw with the servo motor. The machine is driven by direct gear and rack with disc large inertia motor. Direct drive by the linear motor. CNC laser cutting machine is usually equipped with the high precision linear guide, and equipped with an automatic lubrication device. Single-side linear guide rail with roller structure is a typical structure of the cost-effective economic application and convenient adjustment. The other kind of structure is the drive unit structure which directly adopts the combination of drive and guide rail. It is easier to install, easier to debug, easier to ensure the precision, and just a little bit more expensive. Compared with other thermal cutting methods, laser cutting is characterized by fast cutting speed and high cutting quality. Because the laser light spot is small, the energy density is high, the cutting speed is fast, so the laser cutting can obtain better cutting quality. ① The laser cutting incisions are narrow, and the cutting edges are parallel and perpendicular to the surface. The size accuracy of the cutting parts can be up to + 0.05mm. ② The surface of the cutting surface is clean and beautiful, the surface roughness is only a few tens of microns, even laser cutting can be used as the last procedure, no need machining, the parts can be used directly. ③ After laser cutting, the thermal effect area is very small. The properties of the material near the slit are also almost unaffected. And the workpiece deformation is small, the cutting precision is high, the geometry of the slit is good, and the shape of the cross-section of the slit is a regular rectangle. Due to the laser transmission characteristics, the laser cutting machine is usually equipped with multiple CNC workstations, and the whole cutting process can be achieved in all CNC. In operation, the cutting of different shape parts can be applied only by changing the NC program, which can be cut in 2D as well as 3D. The cutting speed can reach 600cm/min for 2mm mild steel with 1200W laser cutter while the speed can reach 1200cm/min for 5mm Polypropylene resin plate. The material does not need to be clamped in the laser cutting, which can save not only the tooling but also the auxiliary time of loading and unloading materials. Cutting torch during laser cutting has no contact with the workpiece and no tool wear. The machining of parts with different shapes does not require replacement of the “cutter”. Only the output parameters of the laser need to be changed. The laser cutting process has low noise, small vibration and no pollution. ⑸ Numerous varieties of cutting materials. 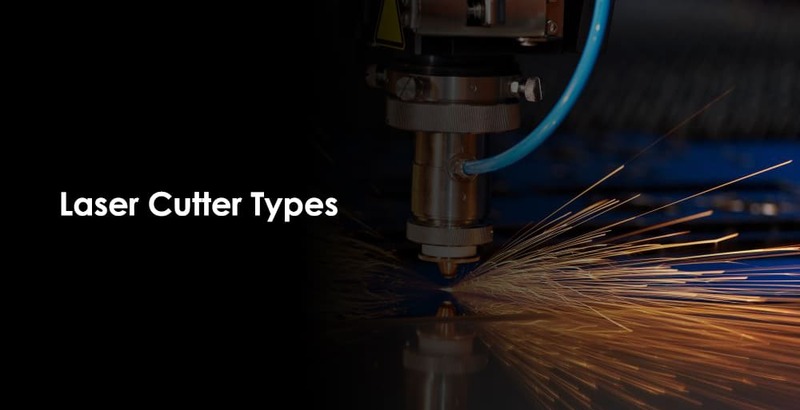 Compared with oxyacetylene cutting and plasma cutting, there are many kinds of laser cutting materials, including metal, non-metal, metal base and non-metal matrix composites, leather, wood and fiber. However, for different materials, due to their own thermal physical properties and different absorption rate of the laser, they will have different laser cutting adaptability. Due to restricted by laser power and equipment volume, the laser cutter can only cut the small thickness of plate and pipe material, and with the increase of workpiece thickness, the cutting speed decreases significantly. 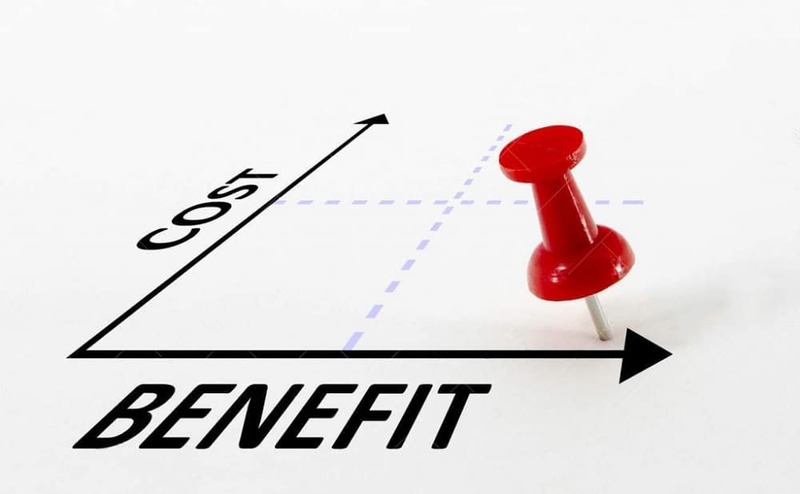 Laser cutting equipment costs high, which means a high one-time investment. The laser beam focuses on a small point of light, which makes the focal point reach a high power density. At this point, the heat input of the beam is far more than the part of the material reflected, transmitted or diffused. The material is quickly heated to the degree of vaporization, and the pore is formed by evaporation. With the relative linear movement of the beam and the material, the hole is continuously formed into a narrow slit. The cutting edge is affected very small by the heat, and there is no deformation of the workpiece. In the cutting process, the auxiliary gas suitable for the cut material is added. When the steel is cut, oxygen is used as the auxiliary gas and molten metal to produce exothermic chemical reaction oxidation material, while helping to blow away the slag in the slit. When cutting plastics such as polypropylene, compressed air is been used. When cutting flammable materials such as cotton, paper, the inert gas is been used. The auxiliary gas entering the nozzle can also cool the focus lens, prevent the dust from entering the lens seat to contaminate the lens and cause the lens to overheat. Most organic and inorganic materials can be cut by laser. the heavy metal processing industry which means a lot to the industrial manufacturing system, many metal materials, no matter how hard it is, can be cut without deformation. Of course, for high-reflectance materials such as gold, silver, copper, and aluminum, they are also good heat transfer conductors, so laser cutting is difficult and can’t even be cut. Laser cutting without burr, wrinkle. It’s in high precision, better than plasma cutting. Although its processing speed is still slower than the die punch, it has no mold consumption, no need to repair the mold, and also saves the time of replacing the mold, thus saving the processing cost and reducing the production cost. Therefore, it’s much more economical generally. The laser beam is focused to form a very small operating point with strong energy, and it is applied to cutting with many characteristics. (3) The minimal local deformation. (3) The cutting material does not need to consider its hardness, that is, the laser cutting ability is not affected by the hardness of the cutting material, and any material with hardness can be cut. (1) It is convenient to combine with automation equipment, and it is easy to automate the cutting process. (2) Because there is no restriction on the cutting workpiece, the laser beam has infinite copy cutting ability. (3) Combined with the computer, the whole plate can be arranged to save material. Compared with other conventional machining methods, laser cutting has more adaptability. First of all, the other methods of thermal cutting cannot cut on a very small area like the laser beam, as a result, it has a wider incision and large heat affected zone and obvious deformation. 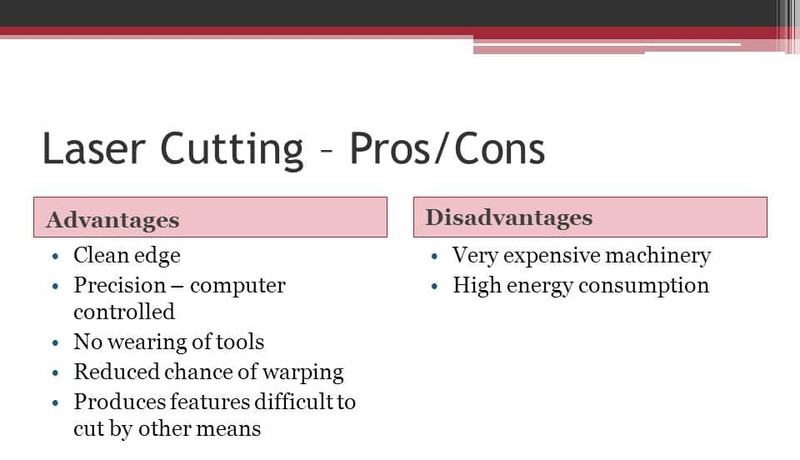 Secondly, lasers can cut nonmetals, while other hot cutting methods cannot. Laser cutting machine is a kind of equipment that can partially replace traditional metal cutting method. It has the characteristics of fast cutting speed and high cutting quality. In recent years, optical fiber laser cutting machine has been widely used to make metal laser cutting more convenient and efficient. But how can we judge whether a laser cutter is good? The cutting quality of the laser cutting machine is an important standard to judge whether the cutting machine is qualified. Based on the years of cutting experience, the following nine criteria are summarized, which can be used as a reference for customers. Sheet metal which is not suitable to make the mold from the technical and economic point, especially the workpiece with complicated contour shape, small batch, general thickness such as 12mm low carbon steel and 6mm stainless steel so as to save cost for making the mold and shorten the time. automatic elevator structural parts, elevator panel, machine tools and food machinery outer cover, various electric gas cabinets, switchgear, textile machinery parts, construction machinery structural parts, large motor silicon steel sheet, etc. Stainless steel (general thickness of 3mm) used for decoration, advertisement, service industry or patterns, marking and font of non-metallic materials (general thickness 20mm). Such as the pattern of art photograph album, Chinese and English fonts of the company, government department, the hotel, the shop sign, the station, the pier, the public place. Special parts requiring uniform cutting. The most widely used typical parts are the die-cutting plate used in the packaging and printing industry. It requires a slot with a width of 0.7-0.8mm on a wooden plate of 20mm thickness and inserts a blade in the slot. Install it on the die-cutting machine to cut off a variety of printed graphics boxes. A new area of application in recent years is the oil screen seam pipe. In order to prevent the sediment from entering the pump, a uniform slit of 0.3mm wide was cut on the alloy steel tube with a thickness of 6~9mm. The hole diameter of the start cutting point cannot exceed 0.3mm. The cutting technology is difficult, but there are still many factories adopt this method and put into production. 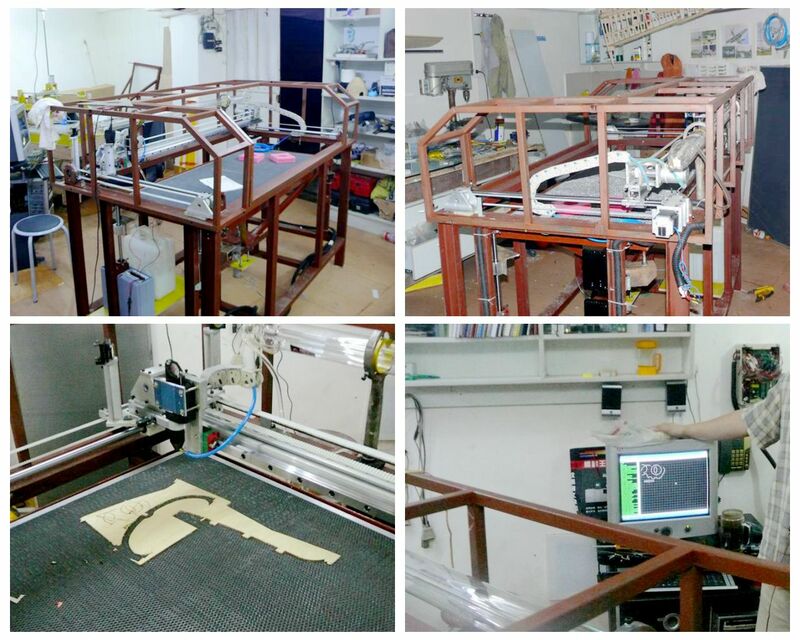 （1）3D laser cutting system or industrial robot is used to cut the space curve. Develop various 3d cutting software to accelerate the process from drawing to cutting parts. （2）In order to improve production efficiency, various special cutting systems, material conveying systems, linear motor drive systems are been developed. The cutting speed of the cutting system has exceeded 100m/min. （3）In order to extend the application of engineering machinery and shipbuilding industry, the thickness of low carbon steel has exceeded 30mm. Special attention is paid to the study of the technology of nitrogen cutting low carbon steel to improve the cutting quality of the plate. The material will get better results when it is cut with oxygen. When oxygen is used as a processing gas, the cutting edge is slightly oxidized. For plates with a thickness of up to 4mm, nitrogen can be used as the gas for high-pressure cutting. In this case, the cutting edge will not be oxidized. The plates with a thickness of more than 10mm can be used to apply the special plate to the laser and oil can be applied to the surface of the workpiece in the process in order to get better cutting quality. Oxygen can be used when the cutting edge oxidization is acceptable. The use of nitrogen to get the edge of non-oxidized and no burr which does not need to be dealt with again. The coating oil film on the surface of the plate will get better perforation effect without reducing the processing quality. Despite high reflectivity and thermal conductivity, aluminum with a thickness of less than 6mm can be cut, depending on the alloy type and the laser generator capability. When cutting with oxygen, the cutting surface is rough and hard. When using nitrogen, the cutting surface is smooth. Pure aluminum is very difficult to cut because of its high purity. Only when the system is equipped with “reflective absorption” device can the aluminum be cut, otherwise the optical component will be destroyed by reflection. Titanium plates are cut with argon and nitrogen as processing gases. Other parameters can refer to nickel-chrome steel. Both materials have high reflectivity and very good thermal conductivity. Brass with a thickness of 1mm can be cut with nitrogen. Copper with a thickness of less than 2mm can be cut and processed, the gas must be oxygen. Copper and brass are cut only when there is a “reflective absorption” device installed on the system, otherwise, the reflection will destroy the optical components. This is a commonly used method, which is to add a parallel optical tube to the output end of the CO2 laser. The beam diameter becomes larger and the divergence angle becomes smaller so that the near end and the far end of the beam are close to the same size. （2）Add an independent moving lens to the lower shaft of the cutting head. It is independent of the Z-axis that controls the distance between the nozzle and the material surface. When the machine tool table moves or the light axis moves, the beam from the near end to the far end of the F-axis also moves simultaneously, so that the beam’s focal spot diameter remains consistent throughout the processing area. （3）Control the water pressure of the focusing mirror, which is usually a metallic reflection focusing system. When the focus beam size becomes smaller and the focal spot becomes larger, the focal curvature of the focal spot will be reduced by automatically controlling the water pressure change. （4）An x and y-directional compensation optical path system are added to the flying ray cutting machine. That is, the compensation optical path is shortened when the distance of far end cutting is increased. On the other hand, when cutting the near end of the optical path decreases, the compensation flying ray is increased to keep the length of the optical path consistent. Any kind of hot cutting technology, except a few cases, can start from the edge of the board, generally must drill a small hole in the plate. Earlier, the laser punch was used to punch out a hole first, then the laser was cut from the hole. After continuous laser irradiation, the material formed a pit in the center, and then it was quickly removed by the oxygen flow with the laser beam. The average hole size is related to plate thickness, and the average diameter of blasting holes is half of the plate thickness. Therefore, the large hole diameter and bad roundness determined it is not suitable to use on parts with a high requirement (such as oil screen seam pipe), and can only be used for scrap. In addition, the oxygen pressure used in the perforation is the same as that of the cutting. The splash is very serious. 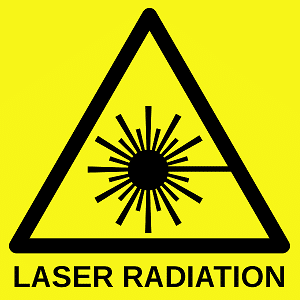 A pulsed laser with a peak power is used to melt or vaporize a small amount of material. Common air or nitrogen is used as an auxiliary gas to reduce the hole expansion due to exothermic oxidation. The oxygen pressure is less than that during cutting. Each pulsed laser produces only small particles that are ejected in depth, so it takes a few seconds for the thick plate to perforate. Once the perforation is completed, the auxiliary gas is immediately replaced with oxygen for cutting. In this way, the perforated diameter is smaller, and the perforation quality is better than that of blast drilling. The laser should not only have high output power, but also the time and space characteristics of the beam. Therefore, the general CO2 laser generator cannot meet the requirements of laser cutting. In addition, the pulse perforation should also have a reliable gas path control system to realize the control of gas type, gas pressure switching and perforation time. In the case of pulse perforation, the transition technology from the pulse perforation of the workpiece to the continuous cutting of the workpiece should be emphasized in order to obtain the high-quality incision. In theory, the cutting conditions that normally change the acceleration section include: focal length, nozzle position, gas pressure. But it is unlikely that the above conditions will be changed for too short a time. When the laser cuts steel, the oxygen and focused laser beam are shot through the nozzle to the cut material to form an airflow beam. The basic requirement of airflow is that the air flow into the incision should be large and the speed is high so that enough oxidation can make the incision material sufficiently exothermic. At the same time, there is enough momentum to blow out the molten material. Therefore, in addition to the beam quality and its control directly affect the quality of cutting, the design of the nozzle and air flow control (such as nozzle pressure, workpiece position in the air, etc.) is also very important factors. The laser cutting nozzle uses a simple structure, namely a tapered hole with a small round hole. Experiments and error methods are usually used for design. Because the nozzle is generally made of copper, the volume is small, and it is the vulnerable part, so it needs to be replaced frequently, therefore the fluid mechanic’s calculation and analysis are not carried out. When used, the gas from the side of the nozzle to a certain pressure Pn(the pressure in gauge is Pg) is used to refer to the nozzle pressure. The gas is ejected from the nozzle outlet and reaches the surface of the workpiece at a certain distance. The pressure is called the cutting pressure Pc, and finally, the gas expands to the atmospheric pressure Pa. The research shows that with the increase of Pn, the flow velocity increases and the Pc increases. For different gases, there are different pressure thresholds. When the nozzle pressure exceeds this value, the airflow is the normal oblique shock wave and the gas velocity transitions from subsonic to supersonic. This threshold is related to Pn, Pa ratio and freedom degree (n) of gas molecules: such as oxygen, air n=5. Therefore, the threshold Pn=1bar x (1.2)3.5=1.89bar. When the nozzle pressure is higher Pn/Pa=(1+1/n)1+n/2 (Pn=4 bar), the normal oblique shock wave is transformed into a positive shock wave. The cutting pressure Pc decreases, the airflow speed is reduced, and the vortex is formed on the workpiece surface, which weakens the function of the airflow to remove the molten material and affects the cutting speed. Therefore, the tapered nozzle of the small round hole at the end is used, the pressure of the oxygen nozzle is often below 3bar. 1. To understand the scope of your company’s production, processing materials and cutting thickness, etc., to determine the models, size and amount of the laser cutter which need to be purchased. Make a simple setup for the later purchase. Laser cutting machine applied in many industries including mobile phones, computers, sheet metal processing, metal processing, electronics, printing, packing, leather, clothing, industrial fabrics, advertisement, crafts, furniture, decoration, medical apparatus and instruments. The most popular model in the market is 3015 and 2513, which is 3×1.5m and 2.5×1.3m (width x length of the bed side). However, the size of the laser cutter is not a problem, generally, the suppliers will provide laser cutter with various size for customer choosing. Besides, it can also be customized. 2. Professional personnel to conduct on-site simulation solution or provide solutions, at the same time, can also take their own materials to the manufacturers for sample making. Whether there is the burr in the cutting surface of laser cutting. Generally speaking, YAG laser cutting machine has somewhat burr, mainly determined by cutting thickness and gas. Generally, there is no burr under 3mm. Nitrogen cutting works best, the oxygen cutting effect is second, the air cutting effect is worst. The fiber laser cutting machine has the fewest burr, the cutting surface is very smooth and the speed is very fast. 3）Check the deformation of the material. For example, if the majority of the factory is to cut the metal plates below 6mm, there is no need to buy high-power laser cutting machine, and the 500W fiber laser cutting machine can meet the production demand. If production is bigger, and worry about the cutting efficiency of the 500w laser cutter is not good than the high power laser cutting machine, the best option is to buy two or more of the small and medium power laser cutting machine. This will help the factory to save some cost and improve profits. 5）The core part of the laser cutter. Most of the laser generator adopt imported IPG brand while the economical type is Raycus brand from China. Besides, special attention also should be paid to other components such as the electrical motor (whether is servo motor), linear guide, frame etc because these components will also generate some influence on the cutting accuracy. One particular thing to note is the cooling system of the laser cutting machine – the cooling cabinet. Many companies use home use air conditioners to cool them directly, and the effect is clear, very bad. The best way is to use the industrial special use air conditioner to achieve the best effect. Any equipment will be damaged in different degrees during use. In the case of repair after damage, it is a matter of consideration whether the maintenance is timely and charged less. Therefore, it is necessary to understand the after-sales service of the enterprise through various channels, such as whether the maintenance fee is reasonable. If you really need it, it’s the easiest thing to buy one. DIY is hard, and you don’t save money. There were laser cutter enthusiasts who DIY one metal laser cutter, the software, circuit and machinery are all designed by himself. Of course, if you want to practice, making a machine from start to finish can be very rewarding. Germany Trumpf, Italy Prima, Switzerland Bystronic, Japan Amada, MAZAK, NTC, Australia HGLaserLab etc. Nothing is the best, only better, you should choose the one which is more suitable for you. Laser cutting belongs to a mature manufacturing process. 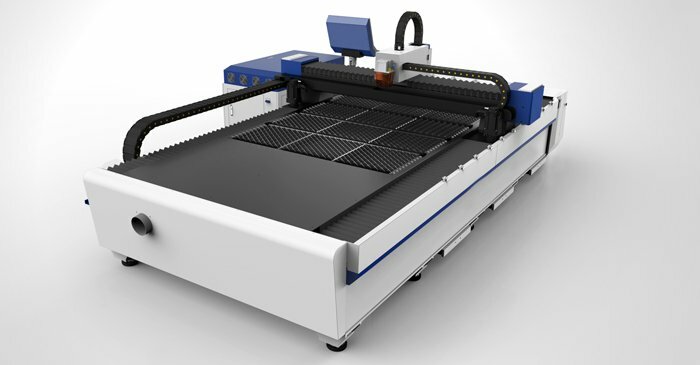 The performance of the laser cutting machine of the first-class brand is not much different, and it is mature from brand to quality and service. There is no burr on the cutting surface. The laser featured thin cutting seam, fast speed and concentrated energy, so it can be transferred to the cutting material with little heat and the deformation of the material is very small. Suitable for large product processing. It is suitable for the development of new products and shortens the development cycle. Once the product drawing is formed, laser processing can be done immediately, and you can get the new product in the shortest time. Laser processing uses computer programming, can make the product of different shape to be cut, which will maximize material utilization rate. How did you get the figure of 70RMB when calculating costs (capital used and time costs)? This is based on real production costs.